Painted up some "spare" Victrix figures for another Black Powder command stand - this one for the 79th Cameron Highlanders. Since I chose to use only standing figures for the basic unit, this is a good way to utilize the kneeling figures. The kneeling guys were originally painted up as 42nd Highlander, but a simple repaint of their facing in green, as well as adding a few red and yellow over stripes to their tartan converted them to 79th. I've seen the 79th's piper wearing a regular red coat with green facings, but I like the reverse colors better for this unit. I hope to get in on a Black Powder game next week at game day up in Seattle - Drumbeat. Plasticard bases with magnetic tops were cut into round bases for the pairing of skirmishers already singly-based on metal washers. This way they can still be used as single-based figures for Sharp Practice games. As they are paired, the British Rifles, along with attached Portuguese Cacadores, will be in two separate 12-man Small units.The French Voltigeurs will be part of mixed formations; their parent units one each Legere and Line battalions. Although mixed formation shooting values are limited to 1, they do receive a re-roll for missed shots being Sharp Shooters. Mixed formation units are also screened by the skirmishers so receive a -1 to hit as targets. They also get to use normal Closing Fire as a charge response since the skirmishers would return to their place in the line or attack column. For a playtest game, I'm thinking of having three smaller brigades instead of two larger ones per side. Since the game will ultimately be hosted at a convention, this will allow for more players and, hopefully, faster playing with less troops per player to move around. Merry Christmas from the King's German Legion 1st Hussars! Merry Christmas everyone from the KGL 1st Hussars! Another quick update, as I may not get around to painting much with the Big Guy's birthday coming up. Managed to paint the heads & busbies, as well as the lining for the pelisses. After debating between the 15th Hussars and the 1st KGL, the latter were settled upon for this unit. The visored busbies are unique to the KGL. The sculpting seems to reflect the Germans' preference for wide sideburns. I didn't realize until after I started painted them that the troupers' flounders for the busby cords are sculpted on the torso. You may want to line up the cords when gluing the heads onto the torso. I removed and re glued one head to more properly aline the two items. Finished the horses, and think I've decided upon the 1st KGL for the riders. The officer's shabraque is colored for this unit - although usually depicted with dog toothed border. Except for the musician's grey, the rest of the horses were given a quick block paint job and then a wash of Minwax Tudor Satin stain. The blue cloth was given a little bit of highlights first. Here they are prior to staining. 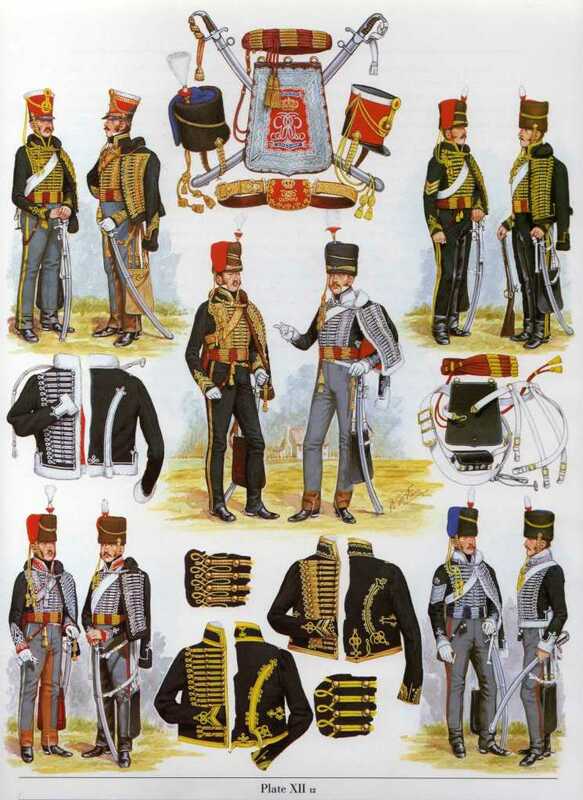 Although not as varied and colorful as the French, the British Hussars have a smart appearance. This time for cavalry units - one each French and British Hussars and a French Cuirassier. As the earlier infantry casualty figures, they're based on cheap plastic poker chips that have received a little bit of dry-brush treatment. These were made from spare parts from Perry and Victirx. The legs are spares from a Perry French Hussars box; heated and bent appropriately for fallen casualties.Green Stuff was used as filler, as well as for belts and the tops of the Cuirassier's boots. The sabretaches were cut out from sample credit cards - the French one has a print out of the design (created by TMPer Aldo) added to it. The sabretache straps were cut from bond paper. Except for the horses, the British Hussars haven't been started upon as I'm still undecided as to which regiment they'll represent. I'm stuck on either the 15th or 1st KGL. The main difference is the 1st KGL trousers are dark blue as their dolmans. Both units have exceptional battle records; the 1st KGL probably being the better though. Here they are mounted on Litko 40X40mm plywood bases - for Black Powder. The colours are actually a spare from a box of Victrix. The flags are folded as much as possible to disguise the fact that they're for the 92nd. Also completed is the Spanish Hacienda kit from Brigade Games. The veranda base is secured with a couple of brass rods. It's suggested that the model be attached to a base to protect it better; I may do this later. Here it is with the Warlord vivandiere as well as some Front Rank Spanish G's. Next up are the new Perry British Hussars. I think they'll be 1st KGL guys. Just need to add the colours - after I drill holes into the hands of the ensigns. The original poles were too flimsy so I cut them off at the hands. Otherwise, I really like these 1st Edition Old Glory figures. The detail is good and the poses look right for being ranked up in close order. Now the British have six battalions of infantry as the French. After the Perry British Hussars are painted, another Black Powder game will need to be played. Just a little update before I head out the door and run errands for most of the day. The dicing pattern on the shako bands are done - except for the green spot where the red lines cross. The Brigade Games Hacienda is painted. It needs a base before attaching the roof for the veranda. The building was primed white and the roofs and floors were primed black. The railings, doors and flooring were painted browns. The roofing was painted a light brownish red - basically a mixture of red, yellow and brown. All the pieces were then given a stain of Minwax Tudor satin. After the stain was dry the parts were sprayed with Testors Dullcote. Finally the stucco areas were give a dry brushing of white. Here is the Hacienda along with another building treated the same way. Here is the Hacienda prior to being stained with Minwax. On Monday I finally received the Old Glory British Light Infantry that I bought off of a fellow TMPer. 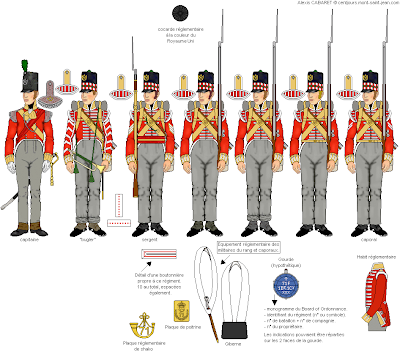 These will be painted as 71st Highland Light Infantry - they'll have that cool diced pattern on their shakos. And to top it all off, a box of the new Perry British Hussars arrived today. It was pre-ordered from Maelstrom Games in the UK. It took less than a week for it to arrive - free shipping, and they give you money back credit for orders too. Highly recommended. The hussars will be painted as either the 15th Hussars or 1st KGL Hussars. They'll be wearing busbies in any case. Oh, the poor French Dragoons will once again be put on the back burner; I need to beef up my British first - especially with their first cavalry unit. 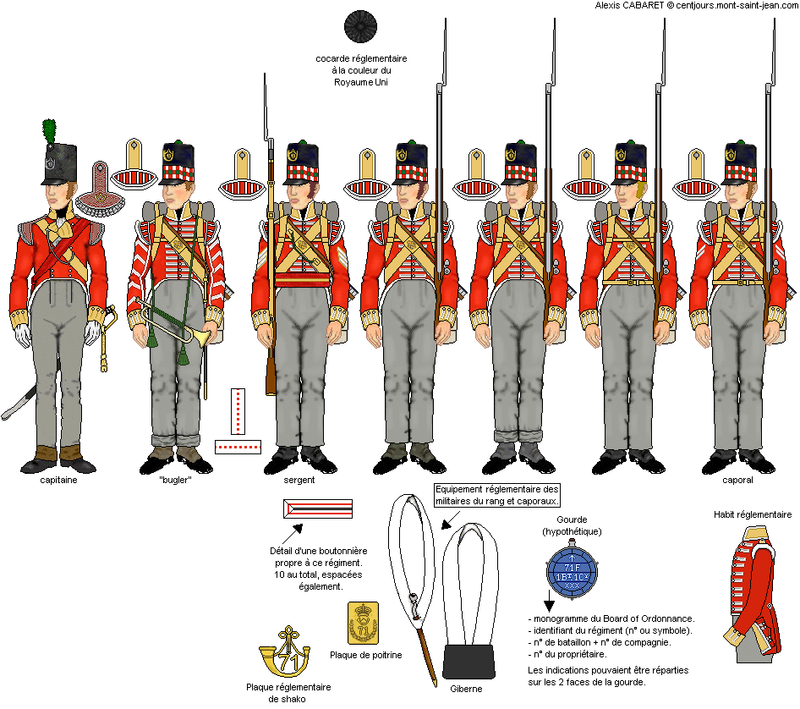 Nothing special, just added some epaulettes to these Perry French Dragoons to indicate their elite status. I also added a plume, raquettes and cord to the bearskin of the musician. 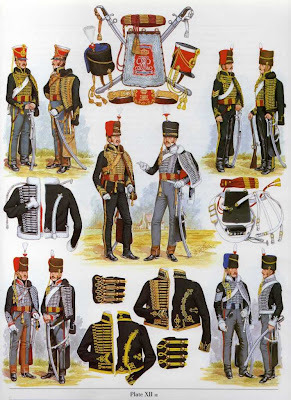 I plan to paint them up as the 16th Dragoons - the musician will be in full dress like the one on the cover of this old uniform book. I'm also working on a Spanish hacienda from Brigade Games. My buddy who I painted the balance of the Perry Dragoons gave it to me as part of the "payment" for the work. He's already given me another Spanish building too. These will come in handy for both Black Powder and Sharp Practice games. I used Green Stuff to help hold the walls and pieces together - then added some Super Glue. Picked up some plywood discs from Jo-Ann's yesterday for .29 cents each. They measure 3 1/4" in diameter, and about 3mm thick. A magnetic sheet was also picked up so I could use figures that were already individually based on either washers or metal bottom bases in the case of the mounted figures. I wanted to keep these figures as singles for Sharp Practice games. Here are three British and two French command stands. I need to pick up a few more mounted commanders to flesh out both armies. The magnetic sheeting was added to the tops of the discs after cutting them a little smaller in diameter. The individual figure bases were than outlined with a ball point pen. Acrylic caulking was squeezed around the outlines and allowed to harden a bit. More acrylic caulking was then added to fill in around the outlines for the bases. Sand was added in irregular patches and after it was dried, the stands were painted a dark brown, followed by dry-brushing of lighter earthy colors. Besides static grass, taller grass (painted brush bristles) and rocks (aquarium pebbles) were also added. I didn't add any period specific articles as I plan to use the same stands for Hail Caesar command bases.